With the oven up to temperature and your loaf proven for the second time, you are ready to cook the loaf. To ensure that you get a really good looking loaf, it is worth having the oven at quite a high temperature, generally for a tin loaf I set the temperature to 220 degrees Centigrade. Place a roasting tin in the oven to get hot before the loaf tin is placed in. 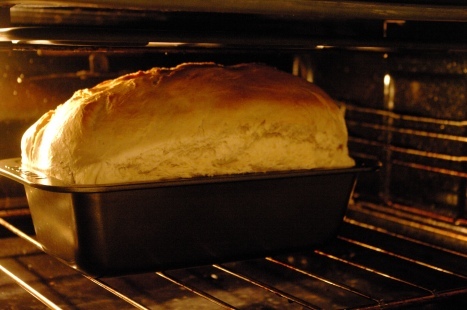 Pour an eggcup full of water onto the hot roasting tin, put the loaf in the oven and close the door. Do not open for at least thirty minutes. Once thirty minutes is up, take the loaf tin and shake it slightly – if the loaf is loose it is done. To confirm tap the bottom of the loaf – it should sound hollow. If it doesn’t, put it back in the oven for another 5 – 10 minutes. Once cooked, leave the loaf on a wire cooling rack for at least an hour before slicing. 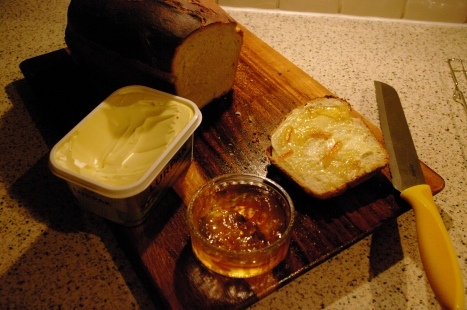 Slicing too early will leave the end of the loaf stale or worse, damp.